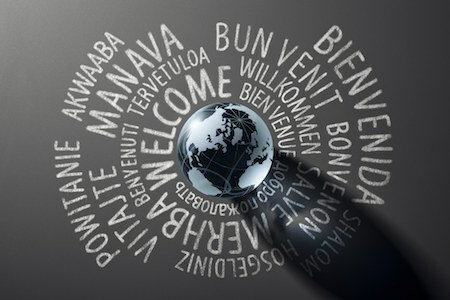 In today’s global society, it’s not at all uncommon for a Notary to receive a request to notarize a non-English document, as was the case in last week’s “What Would You Do” scenario; however, if the Notary is not fluent in the foreign language, there are issues that can arise. In general, most states do not expressly forbid Notaries from notarizing non-English documents. The concern in these cases, however, is that the Notary (a) won’t know exactly how to describe the document in his or her official notarial journal, and (b) more importantly won’t be able to determine if the document contains blank spaces or missing information. In last week's scenario, we learned that the Notary's high school French courses fell short of fluency, so the best option for this Notary would be to refer the signer to another Notary who reads and writes French fluently. If that is not possible, the Notary may be able to proceed with the notarization as long as the notarial certificate itself is in English and it is permitted by his or her state. A number of this month’s respondents expressed caution and concern when it comes to notarizing foreign documents. “Notarizing a document that you cannot read is like signing a blank check,” said Maryland Notary James Witthar. “You don't know what your liabilities are.” Witthar further recommended referring the signer to their nation’s consulate or embassy, which may be able to provide such services for their citizens. “It won’t be easy to detect fraud, so it’s probably best not to perform the notarization,” agreed California Notary Tina Duong. Other Notaries, like Colorado Notary Julie Brickley, are used to performing these types of notarizations, as long as the Notary certificate or statement is in English or a language in which the Notary is fluent, and the Notary can communicate directly with the signer. But if the document is in a language that you don't know, then there's a possibility that it's actually something that isn't supposed to be notarized by a notary public, but you would have no way of knowing. Because I am not an attorney, nor am I allowed to act like one, my only job as a notary is to verify that the person signing is the correct one, that their ID matches them and the signature matches the signature on the ID, and that they are signing the document without coercion, I do not need to know the contents of the document. It isn't up to me to determine the legality of the document, only verification of the signature. To do any more than that, with the exception of making sure that there are no empty areas that could be filled in after the notary, would have me practicing law without a license. The state frowns upon that, with extreme prejudice. I do not have an issue notarizing documents that are in a foreign language. It is not your job to know what the document is or what it says. You are there to make sure there aren't any blank spaces and notarize their signature, that is it! As long as they speak english, your acknowledgement is in english, you have checked for blanks and they have ID you are good to go. The notary's responsibility is to verify the signer's ID, competence, and willingness to sign a document (not believed to be fraudulent). If these criteria are met, plus the notary and signer can clearly communicate directly, and the document has a proper notary certificate in English, the notarization must proceed. The document being in another language is a moot point. When listing the type of document in my journal, I ask the signer to give a brief (4-5 words) description. Katrina and Julie are making a mistake. We Notaries can nor rely on 'translations'; it is nor our business. Just coming back to this since it was reposted on FaceBook.. In response to Arturo's comment... I think you may have misunderstood my use of Google Translator. I do not use it to communicate with a non-english speaking signer (refer to another notary). I do use it to scan the document for title/type of document (to record in my journal), verify the signer's name, look for possible blanks, etc...just as I would do with a document in English. I also use it to look at the notarial wording/request so as to apply the proper notary statement in English, if it is absent. This is not the same as using a human translator. Just last week I used it on a document that did have blanks that needed to be filled in, but had no lines, commas, etc....just blank white space. Had I not used this, I could have notarized a document with blanks on it. Daniel, Terri, and Megan's comments are spot on.. it is not our job to understand the contents of the document, just to verify the identity of the person signing. We are expected to know how to properly handle documents and do our job. Refer to your state's notary law, and check with the Secretary of State's office for clarification. Most will say to proceed with caution, which is exactly what I do.